Teenagers and superpowers, it's officially a thing. In Cloak And Dagger, an upcoming teen sci-fi two teenagers with very different background have to adapt to a life with newly acquired superpowers. 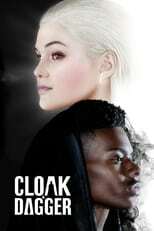 Where can you stream Cloak & Dagger? On 2018-06-07 Action & Adventure/Drama TV Series Cloak & Dagger first aired on Freeform. Written and created by Joe Pokaski, and produced by Marvel Studios, Cloak & Dagger will return and was last broadcasted on 2019-04-11.